Really I’m a bit of a pleaser type. If I write something I’ve got half an eye on what I think folk want to read. 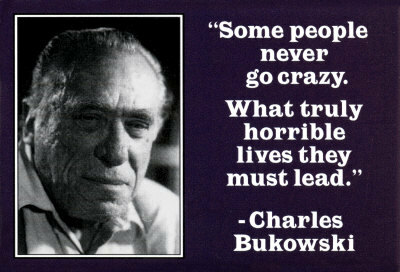 I don’t think I could have been a Charles Bukowski although I do admire him. He portrayed himself as a drunken sexist, although I’ve found that men like me more when they’re drunk. He spent years sending his poetry to editors and getting knocked back. For years he worked as a postman and from his own account in his book “Post Office” was hardly employee of the week. When I’ve entered poetry competitions I have been guilty of double guessing what the judges would like instead of ploughing the arid furrow of artistic truth. In social situations I try to pretend to be kinda like the other folk there and just go home. As an employee I’m semi obsequious because I want people to be pleased with me. I think I am most people don’t you? All of this brings me on to another of my heroes. Yes – you’ve probably guessed it – Silvio Berlusconi, that slimy arrogant self seeker who should be the enemy of all righteous pure people like me. Take a look at this clip which is just so outrageous that when I first saw it I could not believe it. Also notice that he only had about a quarter of the hair on his head that he has today. The point is that people like this represent the possibility of being audacious and getting away with it. I would not want this guy anywhere around me, but I rejoice in the comedy of his vileness. This is a most inconsistent argument and I’m not proud of it. But it sure makes me laugh. I’m missing France and the French language. I’ve been tweaking the foreword to Oscar’s book and called him. In the background he was playing Jacques Brel singing “La Chanson des Vieux Amants”. Brel was an unparalleled genius as a musician and a poet. If you love French, or your soul longs to understand its longings or you feel homesick, have a chocolate and a weep with me. Go on, give in! This song is so beautiful in French. Emma thinx: The imbalance of your inconsistencies = YOU. This entry was posted in Charles Bukowski, chocolate, Emma Calin, Jacques Brel, Silvio Berlusconi by emmacalin. Bookmark the permalink. The video of Berlusconi is unbelievable. No, I don't think I could ever be as cavalier being recorded in public as he is. (I don't think I've picked my nose since I was in pre-school, for one.) But it takes a special sort of person to just not care and do what she wants and I think THAT FREEDOM is what you (and I) envy, even though the person himself may be repulsive.